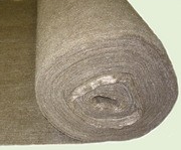 Chopped basalt fiber is made from a continuous roving on the drum chopping machines either independent from the furnace or on the chopping machine which is connected to the furnace. Depending on the application, for which the product is chopped fibers or from the "wet" roving (moisture content 8-10%), coated with water compatible sizing agent, or "dry" roving (the content of sizing agent is 0.5-0.8%) covered with water incompatible sizing agent. Wet chopped fiber is used for the production of veils and various concrete reinforcement methods as an alternative to metal fiber. Water compatible sizing agent is required in these applications so that basalt fibers is easily broken up into monofilaments and are easily distributed inside the matrix. 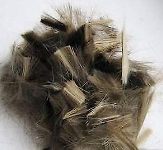 Dry chopped fiber is used primarily for the production of brake pads as a replacement for asbestos, as well as for the production of needle-punched mats. In these applications it is important that the fibers in the volume remained glued together and did not fell apart during the processing. These tasks are successfully carried out with water incompatible sizing. In the case of braking shoes, sizing is also necessary to ensure adherence to the phenolic resin. Basalt chopped fiber length 9mm diameter 13 microns. Has special sizing for asphalt applications. Packed in 35 kg. bags - 77.16 lbs.